I recently entered a Teen Vogue contest to win a Revlon nail art party. I have won these types of parties before (I plan on doing a post about them coming up soon) so of course I entered just to see if I could get the opportunity again. Well, first I should explain where I get these "opportunities". When you sign up at teenvogueitgirls.com you basically get emails/ updates on contests or things you can enter to win free stuff or you can take part in polls and other things of that sort. Previously I had won a Teen Vogue 10 year anniversary party. 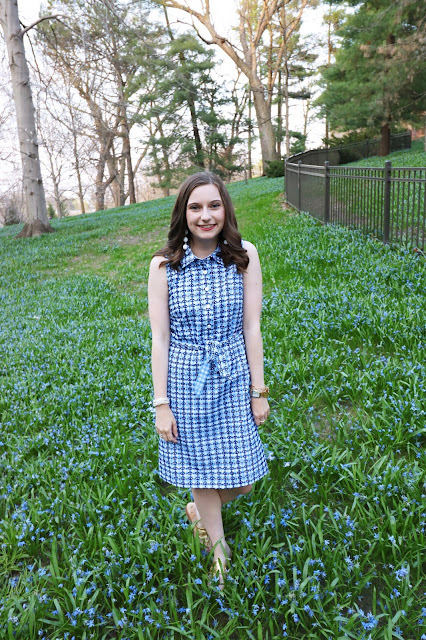 So, I hosted a party with a few of my friends celebrating 10 years of Teen Vogue. Then, later on I also won a party with Revlon where my friends and I got to try out a bunch of new nail polish. But, I will go more in depth about each party when I make those posts. Anyways, I entered to win the party but they said all the spots were taken. However they would like to send me a Vera Wang prize package containing their new perfume. Of course I was on board and excited to try out the new perfume. I went to Khols a few days later on a whim and I saw the perfume they were sending me. When I smelled it I instantly love it! So I was even more excited to get it in the mail. Then I learn they were adding other goodies into the package. Basically things went from cool to amazing instantly. I will stop talking now and show you what I got. I made a "unboxing" video if you want to see my reactions/ see me struggle to open the box. 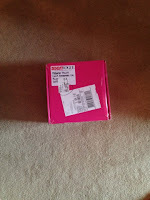 The package came in this super adorable pink box. My favorite part being the Teen Vogue address label. All the items where also wrapped in pink and black sparkly tissue paper. Along with white tissue paper that said Teen Vogue all over it (idk I thought that was cool). Then there was sparkly basically Easter basket grass. I'm not sure what the technical term for that is so we will go with Easter basket grass. On the left is the box for the new perfume Pink Princess. The packaging is super cute and fun. Also very girly which of course I am ALL for. 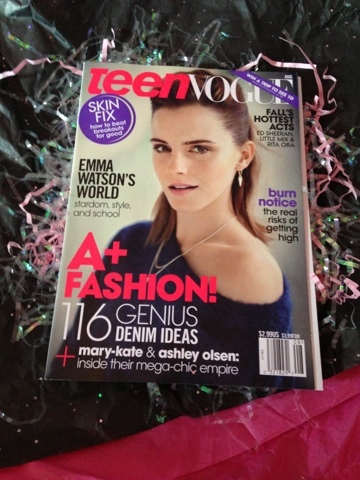 Then they also threw in a current issue of Teen Vogue. I already get Teen Vogue but this one has a little bit of a nicer cover so I will keep this one more of a collectible item. Here is the actual bottle of perfume. 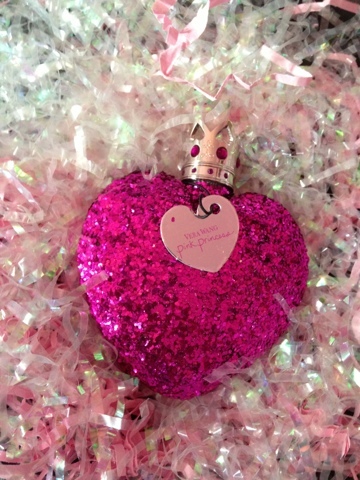 It is a purple magenta pink heart bottle that is covered completely in glitter. 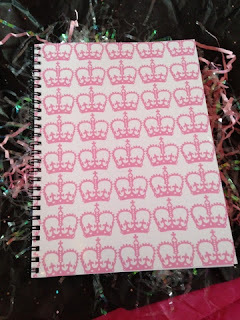 The cap is the shape of a crown with gems on it and also it has a little heart tag that say Vera Wang Pink Princess. Also in the package it came with a few other goodies. I am OBSESSED with these kind of hair ties so I was super pumped when I saw a few in the package. These are perfect to wear on your wrist and they don't crease your hair which also comes in handy. 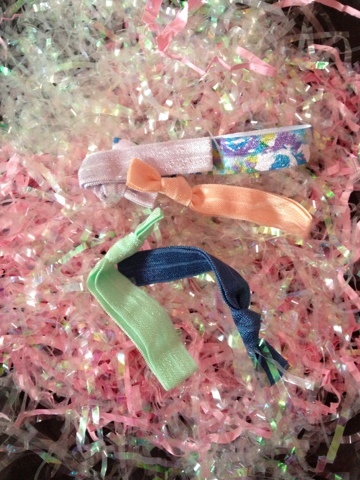 The package came with a blush pink, lavender, mint green, navy, and floral patterned hair ties. 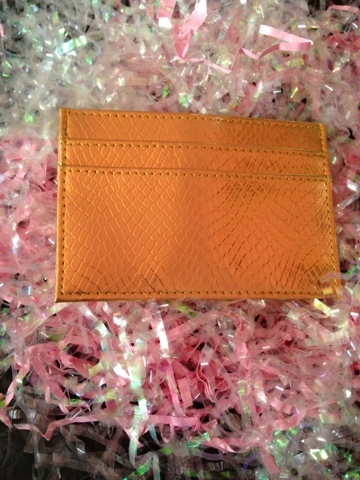 Then there was this small gold wallet. A fun detail is that it says Teen Vogue on the inside of the wallet. The last two things are a cute notebook with pink crowns on it and this striped scarf. 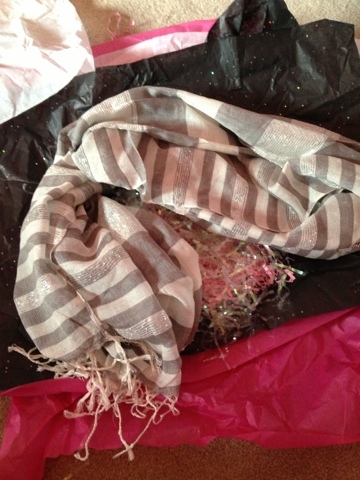 The scarf has hints of silver metallic but is still neutral enough to be paired with a lot of different things.